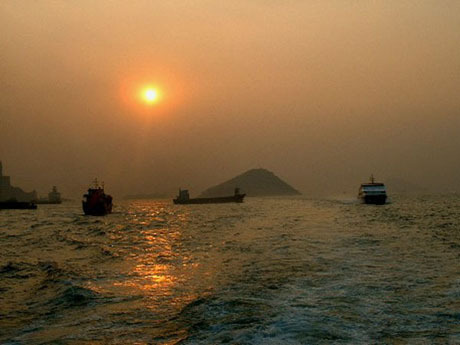 Hong Kong’s main outlying islands are served by regular scheduled ferry services from Hong Kong Island and some are also connected by inter-island ferries making it easy to combine a cruise with exploration of these scenic islands and see a completely different side of Hong Kong. 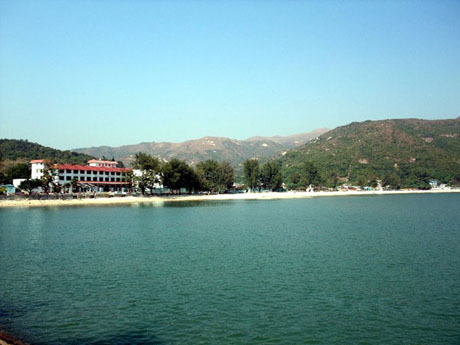 Peng Chau, Cheung Chau and Lantau are also connected by Inter-Island Ferry and another ferry connects Peng Chau with Nim Shue Wan at Discovery Bay and the Trappist Monastery on Lantau. It is easy to construct a self-guided itinerary by using the ferry timetables but here is a suggested day round trip from Hong Kong Island to Peng Chau, Lantau and Cheung Chau. Ferries to Peng Chau operate from Central Ferry Pier 6 on Hong Kong Island. They operate at about 45 minute intervals alternating between the Fast Ferry catamaran service and the Ordinary Ferry. Although the 40 minute journey on the ordinary ferry is about 15 minutes longer than the fast ferry there is usually an open deck at the back of the ferry which makes for a more enjoyable journey and allows for much better views than being behind the sealed windows of the Fast Ferry. Ordinary ferries leave at 8-30am and 10am (7-50am and 9-30am on Sundays and Public Holidays) and taking either of these ferries will ensure plenty of time to explore some of the three islands. The ferry cruises along the northern Hong Kong Island coastline westwards slipping past the island skyscrapers whilst to the north looking towards Kowloon is Stonecutters Island and the huge container terminal. Around is all kinds of shipping activity, high speed jetfoils racing to and from Macau and China, sampans, kaidos, ferries, huge cargo ships and container ships at anchor being loaded and unloaded by lighter ships. On its journey the ferry passes several islands the first of which are Green Island and Little Green Island at the end of Hong Kong Island. Soon the chimneys of Lamma Island’s power station appear whilst to the north the Tsing Ma Bridge looms into view in the distance and further along the Lantau coastline you can see the Disneyland hotels at Penny’s Bay. To the south are Hei Ling Chau, a small island with a correctional institution and addiction treatment centres, and Cheung Chau. 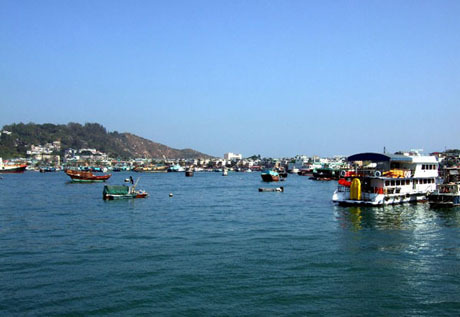 The ferry rounds the southern side of Peng Chau before arriving at the ferry pier. Peng Chau with a population of 7000 has no cars, only bicycles and a few motorised carts. It takes only about one hour to walk around Peng Chau. 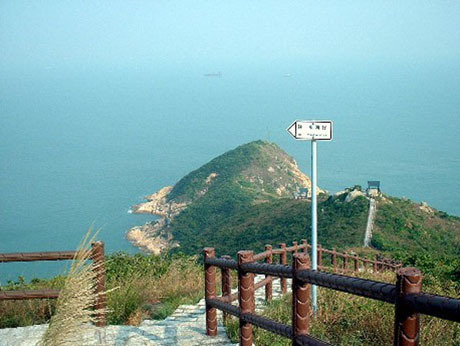 The energetic can climb the steps up Finger Hill, the highest point on the island (95m) and will be rewarded with scenic views across to Hong Kong Island, Hei Ling Chau, Lamma, and Lantau. There's a pavilion with seats at the top of the hill for those wishing to take a deserved rest. By the ferry pier are narrow shopping streets and alleyways and sitting out areas where many of the the older local residents spend much of the day lazing around. There is a reasonable beach at Tung Wan which is directly across from the ferry pier on the opposite side of the narrow central part of the island. To continue the trip make sure to catch the 11-55pm Inter Island ferry to Mui Wo on Lantau Island (the next ferry is 1-35pm). It’s a short hop, about 15 minutes, to Mui Wo and the ferry has an open sided canopy covered rear top deck area which is preferable to the lower deck. The ferry passes the Kau Wat Shan Government Explosive Depot on Lantau before rounding the headland and turning into Silvermine Bay. The ferry pier is next to the bus terminus and here many passengers arriving on ferries from Central catch buses to Ngong Ping and Tai O. There are plenty of places to eat around the ferry pier, McDonalds, seafood restaurants, Mui Wo Cooked Food Market, bars and cafes. The next leg of the journey is the Inter Island ferry to Cheung Chau at 2pm and in the meantime there is plenty of time to explore the area. Silvermine Beach in front of the Silvermine Beach Resort is a good place to relax and there are plenty of interesting footpaths around the bay. The 2pm ferry is the same boat as the 11-55am sailing from Peng Chau. It does a continous circuit of the islands from 6am until midnight. 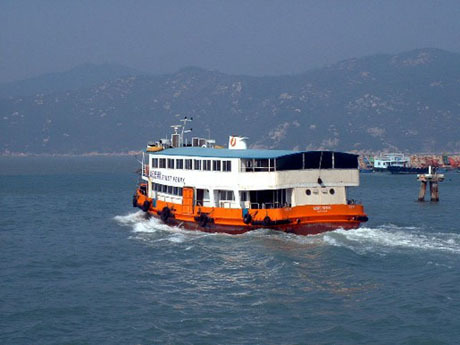 The ferry sails out of Silvermine Bay and around the headland into the channel between the Chi Ma Wan Peninsula and Hei Ling Chau before arriving at the small Chi Ma Wan Ferry Pier in about 20 minutes. By the ferry pier is a correctional institution and residents can often been seen meeting the ferry to assist in transporting supplies to the institution. Across the channel the typhoon shelter protecting the western side of Hei Ling Chau can clearly be seen. From Chi Ma Wan the ferry crosses the busy Adamasta Channel from where there are views of Shek Kwu Chau with its treatment and rehabilitation centre and the distant Soko Islands. Soon the ferry enters the Cheung Chau typhoon shelter and colourful busy harbour 20 minutes after leaving Chi Ma Wan. Cheung Chau is a fascinating and endearing island with a population of 20,000, a hive of activity day and night and similar in shape to Peng Chau but larger and much more interesting. 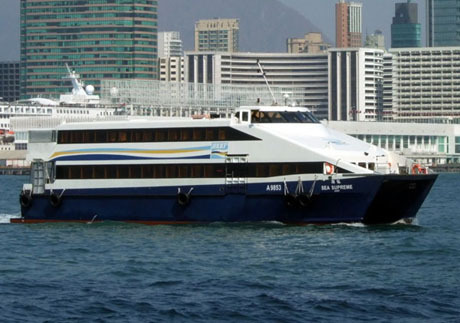 Ferries from Cheung Chau to Central operate at approximately 30 minute intervals until about midnight following which there are a few sailings during the night and time here need not be limited by the ferry schedule. Cheung Chau is another island with no cars apart from a couple of small police and fire service vehicles and bicycles jostle for space with pedestrians on the busy streets. Bicycles, canopy covered tricycles and pedal carts can be hired from cycle shops on the harbourside and make an easy way to explore the flat western side of the island. The harbour itself is busy with a large fishing fleet, kaidos, sampans, ferries and houseboats. 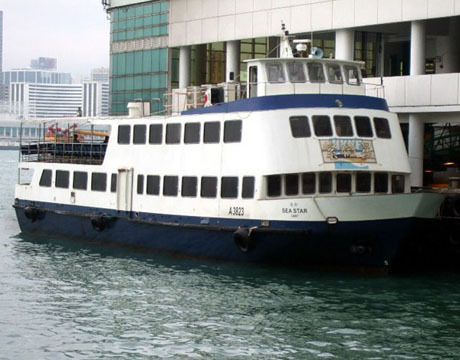 A sampan ferry service operates within the harbour connecting the public pier next to the main ferry pier with Sai Wan ferry pier. It operates every 15 mins or so until 8pm but on Sundays and Public Holidays services are more frequent. It’s a good way to tour the harbour for HK$3 each way (local residents only pay HK$2). The harbour is lined with seafood restaurants and McDonalds has an inevitable presence by the ferry pier too. In the narrow streets in the central part of the island is a myriad of shops selling goods of all description and mostly until 10 or 11pm. Before daylight expires however visitors should take a little time to explore some of the scenic beauty of this island. Following the path across the narrow central causeway directly opposite the ferry pier leads to the main beach, Tung Wan Beach. 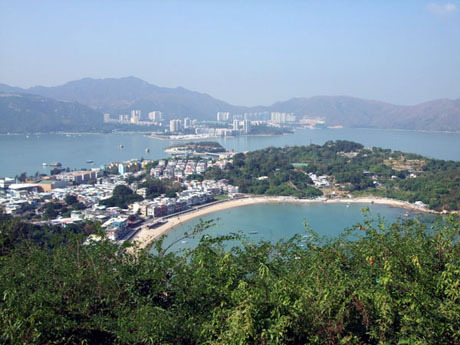 To walk the whole way around the island takes about 3 hours but a good sample of what this island has to offer is to walk firstly to Tung Wan Beach and then past the Warwick Hotel round the bay past the helicopter landing pad to the Windsurfing Centre. From here follow the scenic family trail along the Mini Great Wall out to the rugged coastline past Loaf Rock, Vase Rock and Human Head Rock. Continue round the coast by climbing the steps and following the trail to Fa Peng Knoll and Don Bosco Road. From here visitors can either climb up Peak Road from where there are views across the crowded central part of the island and then walk downhill back to the ferry pier or continue to Nam Tan and around the coastline joining Peak Road further along. 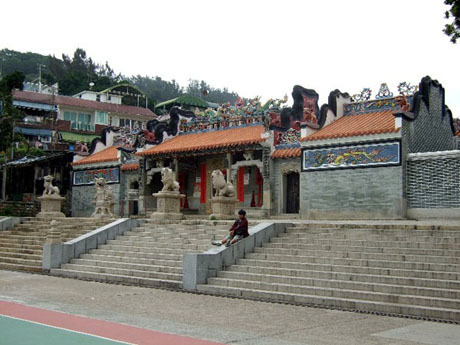 Peak Road eventually leads through the huge cemetery and to Sai Wan Ferry Pier but you can take the diversion down to the unspoiled sandy Pak Tso Wan Beach and continue past Reclining Rock to the Cheung Po Tsai smugglers cave and Tin Hau Temple before emerging at Sai Wan Ferry Pier. The ferry journey back to Central takes 30 minutes on the Fast Ferry or 50 minutes on the Ordinary Ferry. Ordinary Ferry is preferable unless time is of the essence (the Fast Ferry is a catamaran with sealed windows and often poor visibility). Choose Deluxe Class on the triple-deck Ordinary Ferry (either at the turnstiles on entry to the pier or upgrade with Octopus Card on the ferry until 10 minutes after departure - a crew member is stationed with portable Octopus Card machine at the bottom of the stairs leading to Deluxe Class deck). Deluxe Class is on the top deck with an open sundeck at the rear and Deluxe Class also has an air-conditioned cabin. Daylight fades away between about 6pm and 7pm depending on time of year and at night time the Ordinary Ferry allows for spectacular views of the illuminated buildings of Hong Kong Island as the ferry approaches Central.